The “Danzhai Miao-style Wedding Clothing Show” concluded last night at the new Danzhai grand theater in Danzhai Wanda Village. 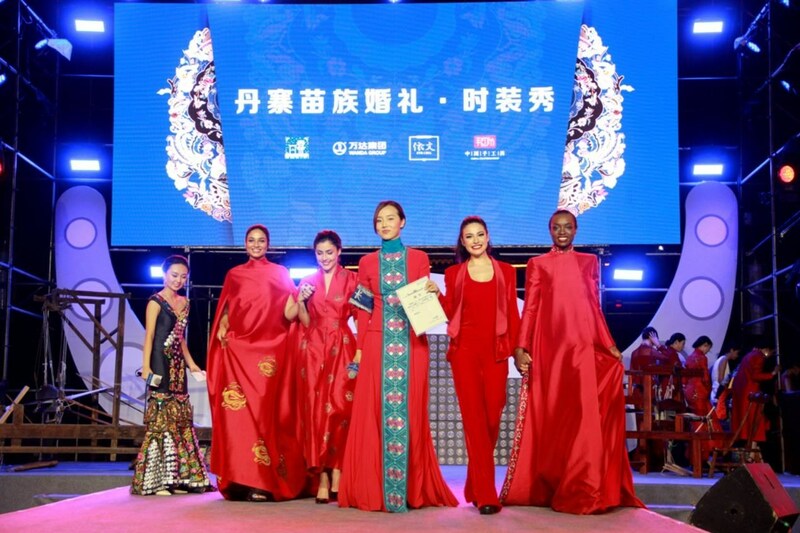 The “Miss World” contestants from five continents gathered in Danzhai County and celebrated the first anniversary of Danzhai Wanda Village with hundreds of thousands of people from across China by showcasing delicate Miao-style fashion and clothing designs to the world. Led by Du Yang, the champion of the 2014 Miss China World and the 47th “Rotating Mayor” of Danzhai Wanda Village, the “Miss Worlds” were all contestants of the Miss World 2014, coming from five continents and including Julia Gama from Brazil, Larissa Ngangoum from Cameroon, Daniela Alvarez from Mexico and Tatjana Maulfrom the Netherlands. In addition to their participation in the “Danzhai Miao-style Wedding Clothing Show,” the “Miss Worlds” will also interact with local women working in the handicraft industry, such as Miao-style embroidery and silver making, and visit Guizhou Wanda Vocational and Technical College to help inspire the students to pursue their dreams and have the courage to express themselves and the confidence to show their natural beauty. The “Danzhai Rotating Mayor” campaign recently won a Bronze Lion at the 2018 Cannes Lions International Festival of Creativity. On June 20th, 2017, Wanda kicked off the global online recruitment for rotating mayors with the July opening of Danzhai Wanda Village. Each week, a new mayor takes office to enact and implement programs that will aid and benefit the development and sustainability of Danzhai. The recruitment webpage has received more than 15,000 applications to date. Helped by the “Rotating Mayor” program, Danzhai Wanda Village received more than 5.5 million tourists in its first year, generated around RMB 3 billion in tourism income and helped lift tens of thousands of people out of poverty. Danzhai Wanda Village is located in Danzhai County, Qiandongnan Prefecture, in southwest China’s Guizhou Province. It is Wanda’s pioneering project for targeted poverty alleviation, under which a company is responsible for lifting a whole county out of poverty. Since 2014, Wanda Group has donated RMB 800 million to build this Miao-style village. Wanda’s initiative in Danzhai also includes a RMB 300 milliondonation to build a vocational school and a RMB 500 million poverty alleviation fund. The three projects respectively represent the overall project’s medium, long-term, and short-term strategies. To continuously attract more visitors to Danzhai Wanda Village and make it sustainable, Wanda Group decided to donate RMB 500 million in addition to the previously donated RMB 800 million for the construction of Danzhai Wanda Village Phase II. The construction plan includes a show stage dedicated to a large-scale Miao opera and a dance situational experience show called “Splendid Danzhai,” a multi-functional conference and cultural activity center and a spa resort hotel village that hosts three hot spring hotels, among which the first two have officially opened for business on July 3rd. Wanda will also invite further investment to help upgrade opportunities for recreation in the Village and provide tourists with brand-new travel experiences, aiming to transform Danzhai into a popular tourist resort in China and the whole world.